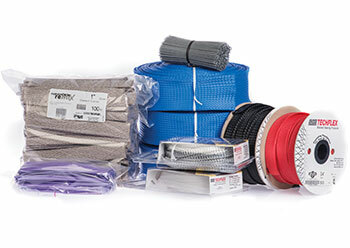 Along with our own retail products lines, Techflex has been packaging braided sleeving products for other companies since our inception.We’ve produced everything from simple plastic bags with header cards to blister packs to revisions of our existing clamshell templates to fully customized packaging solutions.Additionally, we can create custom spool solutions to fit your unique storage and branding requirements. When necessary, cut pieces can be either coiled, spooled or bundled to meet any specific customer requirement. Coiling and spooling ensure the most efficient and space saving solution for storage and management of sleeving inventories. Material bundled in consistent quantities allows easy disbursement of cut pieces to assembly personnel in any production environment. Heat treating and rounding the spooled sleeving opens it up and “sets” it so that it remains open along the entire length. 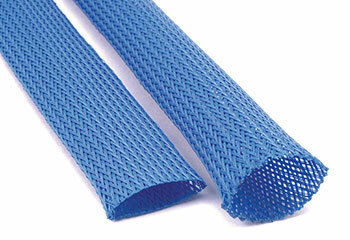 The sleeving retains all of its original properties, and installation is even easier for long runs of wire or cable. Some splices are normal during the braiding process. Usually, not more than one or two splices will be on any given spool. 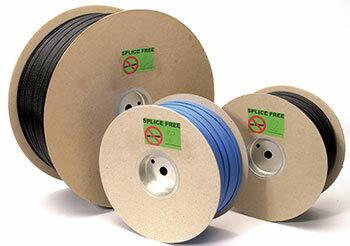 Ordering splice-free spools guarantees the maximum continuous yield on your spools. Spools, coils or bundles of cut pieces can be labeled and packaged to specific customer specifications. Customer part numbers, inventory control barcodes and product logos are just some of the standard labeling options. Orders can be shipped in bulk or against a shipping schedule to ensure consistent and timely product availability in JIT or Kanban environments.